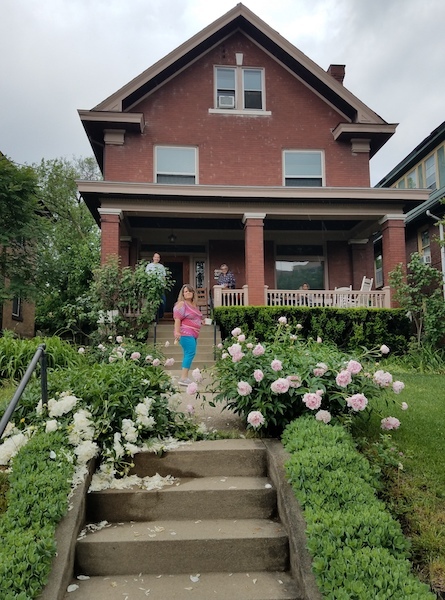 The Runge Cousins Reunion took place in Cincinnat this year, May 19-20, hosted by Jerry Froehlich and Laura Goodell in their beautiful historic home. They live a couple minutes' walk from Ludlow Avenue where we found abundant shops and restaurants. In attendance: Jerry Froehlich & Laura Goodell, Cincinnati; Judy & Conrad Froehlich from Chanute, Kansas; and Mark and TJ Runge from St. Peters, Missouri. From Indiana: Dagmar Schilke, niece and nephew Lissa and Hung Lî, and their children, Trinity and Jonathan. I was there representing Tempe, Arizona. 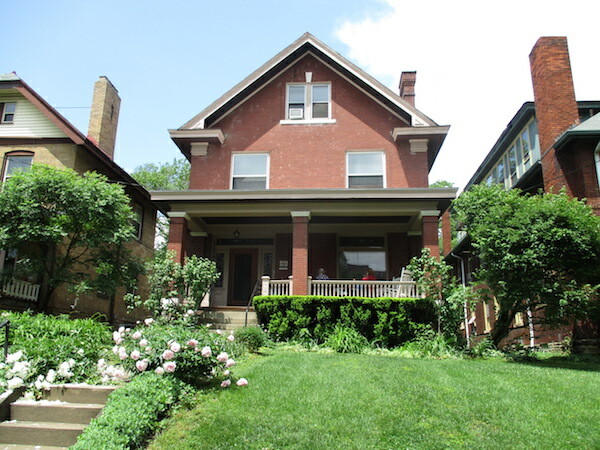 Besides giving their house up for party central, Jerry and Laura provided lodging for Conrad and Judy, and me. Laura was a great hostess despite nursing a broken wrist. Luckily TJ is trained as an EMT and took good care of Laura all weekend. The lovely home we called party central. Photo by Conrad Froehlich. 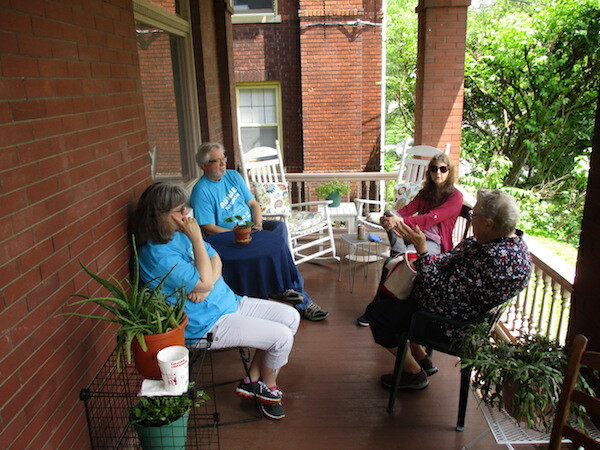 Judy, Mark, Nori, and Dagmar discussing politics on the porch. Oh noes! (It was okay!) Photo by Conrad Froehlich. 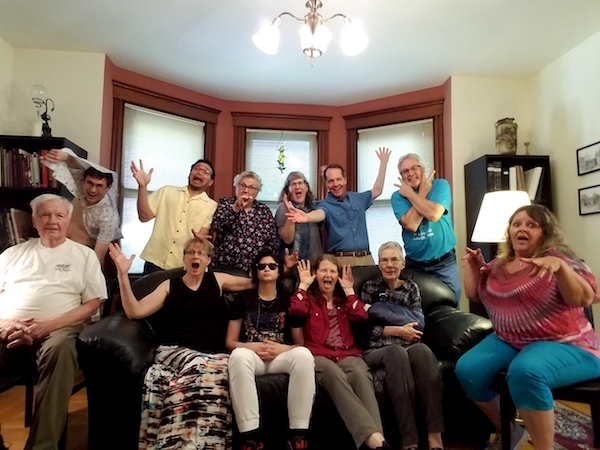 For any relatives who have never been to a cousins remion, I just want to convey how much fun we have at these short get-togethers. This time we discovered the higher than average number of artists, musicians, and writers in our family line. Jerry is an artist, writer, and retired architect, who just published his memoir. TJ is an artist and writer, and I am too. Trinity is a professional pianist who is playing in Steinway competitions at home and in Germany this summer. We also have writers, artists, and musicians going right up the family tree. We encourage any descendants of Pastor Carl Runge to join us - we hold the reunion every two years. 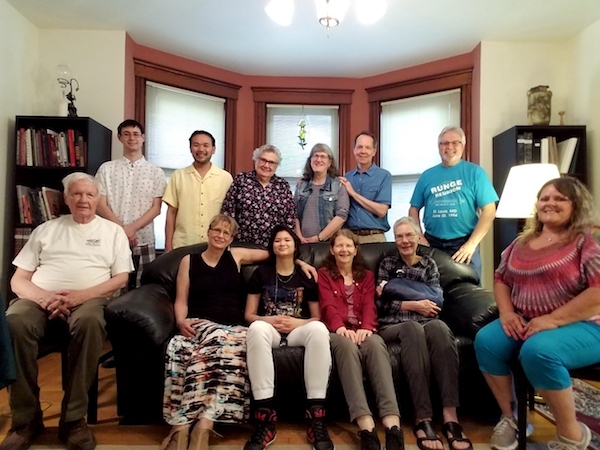 The current iteration dates back to 1984; prior to that our Runge ancestors held reunion picnics in Iowa every summer going back to the 1940s. Back row: Jonathan, Hung, Dagmar, Judy, Conrad, Mark. Front row:Jerry, Liisa, Trinity, Nori, Laura, TJ. Photo by Mark Runge (with timer). Jerry Seinfeld photo: "Who are these people?!" Photo by Mark Runge (with timer). This year's reunion was nonstop visiting - including all day Saturday with the Indiana crew. For lunch, we walked up to Ludlow for take-away brown rice, avocado, and beans at Whole Bowl, and a couple boxes of cookies from Gaslight Gourmet Cookies. Later that afternoon we walked back to Ludlow to try out Graeter's ice cream. 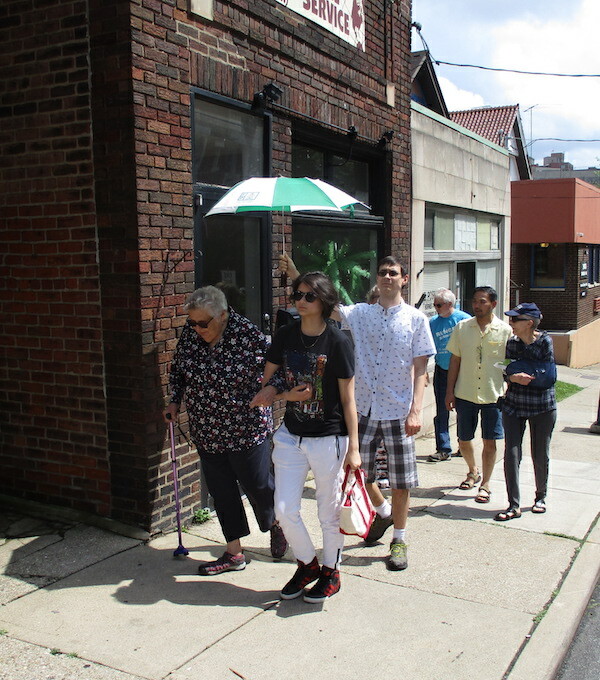 Up the hill to Ludlow Avenue for treats - Dagmar, with her great niece and nephew Trinity and Jonathan, followed by Hung and Laura, with Mark bringing up the rear. Photo by Conrad Froehlich. This is street art we trod over every time we walked to Ludlow. 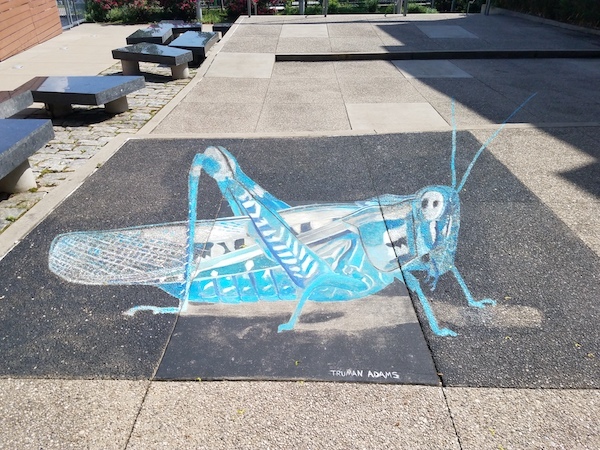 It is said the grasshopper looks three dimensional on film. Photo by Mark Runge. After the Indianapolis crew headed home, the rest of us made our way to the Kentucky riverfront to board the Belle of Cincinnati for a dinner cruise. The food was great and the cruise was beautiful - many good memories. 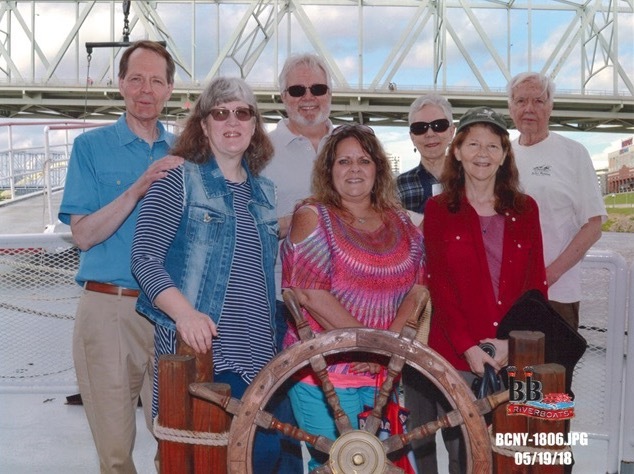 Our group on the Belle of Cincinnati: Conrad and Judy, Mark and TJ, Laura and Jerry, and me. Photo by BB Riverboats. 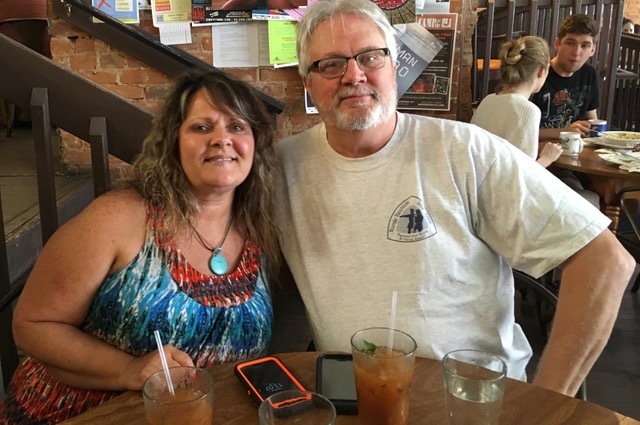 Sunday, Mark and TJ, Conrad and Judy, and I enjoyed a jazz brunch at Lydia's on Ludlow. The food, live music, and company were great. 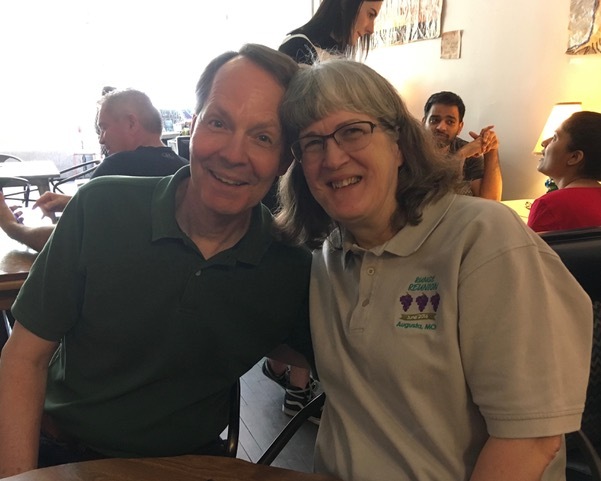 Jazz brunch at Lydia's: Conrad and Judy. Photo by Nori Muster. Mark and TJ. Photo by Nori Muster. Conrad, Judy, Nori, and TJ at Lydia's. Photo by Mark Runge. After brunch we sat around on the porch at the house brainstorming with Jerry and Laura about our pick for 2020. We all liked the idea of going to Spearfish, South Dakota, since not everybody was able to attend last time. But we are still open to considering other locations for the next reunion. Memoir by Jerry Froehlich - click here. Just published! For my photos of the Belle of Cincinnati and other sightseeing I did in Cincinnati - click here to go to Steamboats.com. Here's a simple chart - it all goes to prove once you get past parents, siblings, children, aunts, and uncles - all your other relatives are cousins!